These koi pond kits are excellent for the do-it-yourself pond enthusiast. 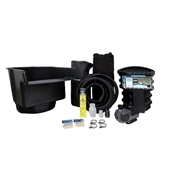 Pond assembling and care are made easy with these all-inclusive pond kits. 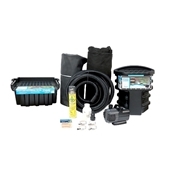 All of our fish pond kits contains a pond skimmer, waterfall filter, magnetic-drive koi pond pump, EPDM koi pond liner, liner underlay, spiral tubing, check valve discharge kit, water conditioner, bacteria, waterfall foam and written installation instructions. These koi pond kits are easy to install and built to last. If you are a beginner, don't be intimidated. These Happy Koi Pond Kits take the guesswork out of pond assembly and help you create beautiful ponds with ease. Because our fish pond kits come with all the pond supplies you need and easy-to-follow assembly instructions, you don't have to worry about forgetting a crucial piece or making a major mistake. Start creating the koi pond of your dreams today. Browse our koi pond kits displayed below, and check out the other koi and goldfish products we have to help you create a flourishing fish pond in your backyard!